In a small saucepan, heat caramel ingredients on low heat for 5 minutes until there is a low rolling boil around the edge of the mixture. Remove from heat and set aside. Place coconut milk, raw honey, and vanilla beans in a medium saucepan over low heat. Whisk until everything is well-blended. Remove from heat and set aside. Whisk two egg yolks in a separate bowl. 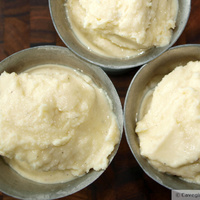 Temper the yolks by adding a small ladle of the ice cream mixture, stirring continuously so as to not “cook” the eggs. Add a second ladle to egg mixture. Once combined, pour this back into the saucepan and stir. Add the caramel mixture to the ice cream mixture. Stir until combined. Refrigerate until completely cooled. Follow the directions on your ice cream mixer as each one may be a little different. Once your main mixture is blended, transfer to a freezing container/lidded bowl. Freeze. After 30-45 minutes, stir mixture again. I think the best stage of “paleo ice cream” is after the first 1-3 hours of freezing.